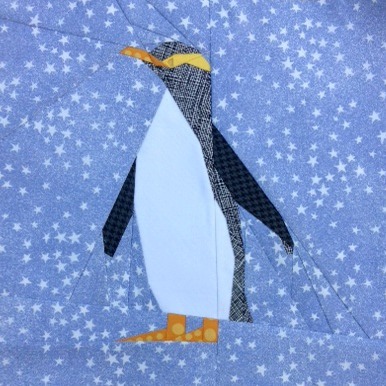 I have been wanting to have a go at sewing this penguin pattern ever since I designed it, but I held off until I found the right fabrics. Black is not a colour that I have had much of in my stash so far, so I had an excuse to go looking for exactly the right print. I think I found it! While I was looking for fabrics, I set my wonderful pattern testers to work. Michelle did a great job as always. I love her scrappy style and the way that it gives this wee guy such personality! Helen has done some immaculate piecing and I love her fabric choices. Didn't Cathy make a cute wee penguin?! All three pattern testers admitted to differing degrees of intimidation when they saw the tiny pieces around the eye, but two out of three testers told me to leave the tiny pieces there. Brownie points go to Michelle who managed all the pieces on a 10 inch block! She showed the others that it could be done. After discussion with the testers, I have decided to include a sanity saver in the pattern. This is an alternative simplified version of the eye area in the pattern. 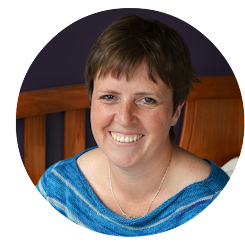 It allows those who buy the pattern to choose between piecing all the teeny tiny eye detail or piecing the main details and then adding the eye with fabric marker pen; embroidery or a bead. Cathy's Penguin shows the sanity saver in action. As you've probably worked out, I love piecing all the tiny details, but I recognise that this may drive some people seriously insane! I want people to enjoy sewing my patterns so I have no problems adding a little compromise here and there. I haven't decided on the colour of the sashing yet, so will probably try a few different options over the next few weeks when I create a collage of the quilt. 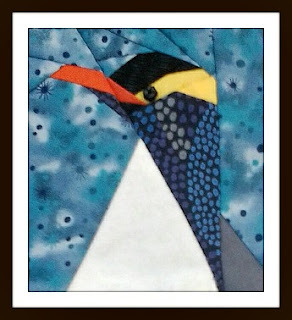 My Penguin pattern is now available for sale from my Craftsy Store. 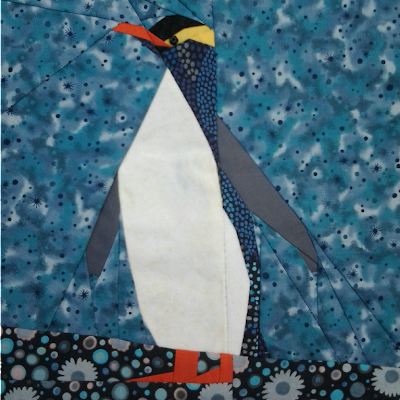 If you would like to get your hands on my penguin pattern and and another Tartankiwi pattern of your choice, then leave a comment below. I will choose a winner after 5:00pm NZT on Sunday 15th September. I will do my best to contact the winner, but if I have not heard back from them within a week I will choose a new winner. Love this pattern and already bought it. That black fabric is perfect - it looks exactly like the little short feathers of a penguin! I love this whole set of bird patterns! You do a great job. Such a cute penguin. 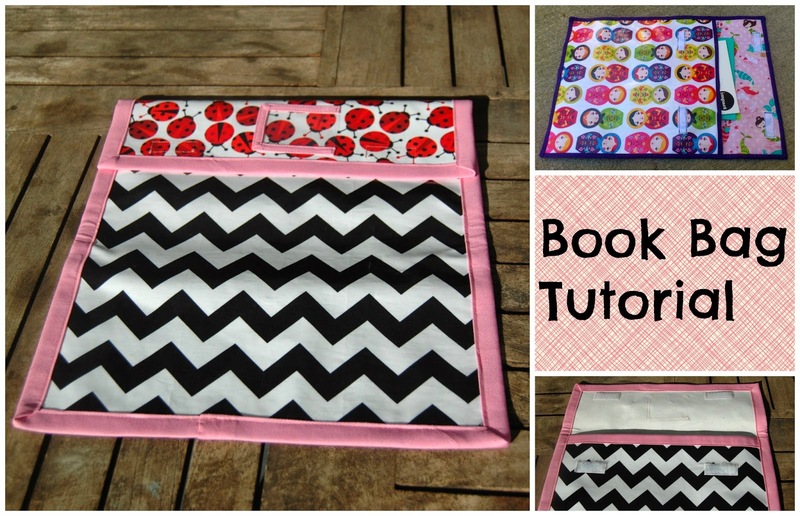 Your bird quilt is looking great too. this is gorgeous - I think my favourite of all. Don't put me in the draw (you know I'll never make it!) but I wanted to say well done! I love all the penguins! So cute! love your's the black fab is prefect and that measuring tape pretty darn cool too. I love this block! 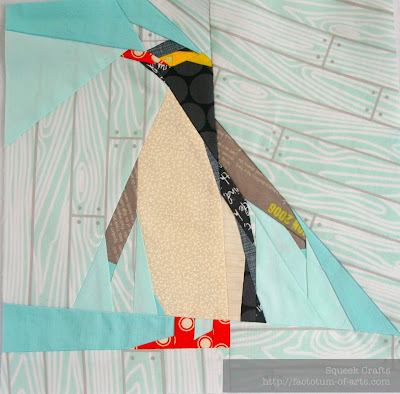 The penguin is so cute and all the different fabric options are just fabulous! Great job! I love your bird series, they look just gorgeous in such different fabrics. I can't wait to see them all! He's so cute! My son is really into penguins and fur seals at the moment due to school studies. Such a cute penguin. That quilt is going to look fabulous, can't wait to see it finished! Wow - they're looking fantastic. I think one of the great things about foundation piecing is that the little pieces are no biggie! The Kea is my favourite. The black fabric for the penguin in perfect. I love the penguin but I think my favourite so far is the Kea! I wanted to say that I really like your penguin and I like how you used the music fabric for his belly area. I agree Michelle did a great job as always. I too like her scrappy style and the way that it gives this wee guy such personality, especially the feet--makes it look like he is wearing boots.Helen's and Cathy's are adorable as well. I always find it interesting how different fabrics change the look of the same pattern. Would love to have the pattern myself. 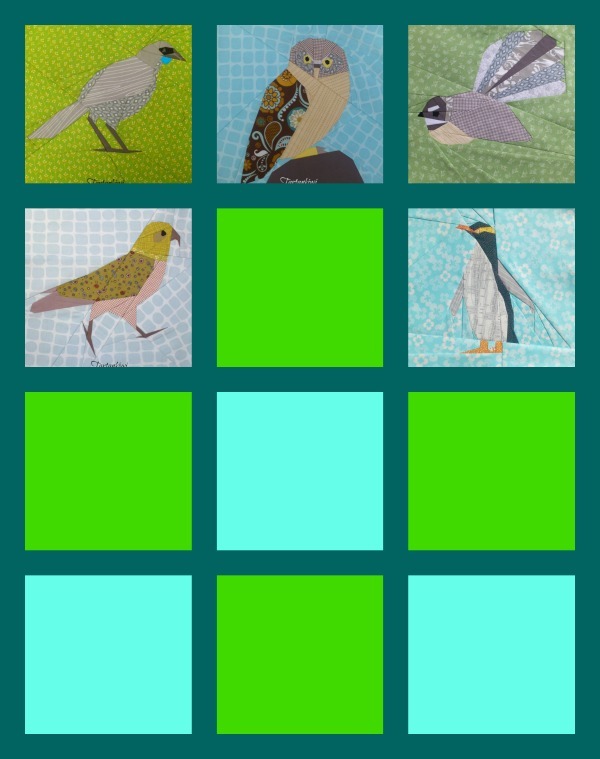 I love all your bird patterns and the way you give them all 'personality ( in a birdy way!). I'd be thrilled to win this pattern! love the bird quilt so far, can't wait to see the rest!